Sometimes we get an interesting perspective - based on our readership at least - of what 'clicks' with the eShop audience and what doesn't. Some games get a lot of buzz right off the bat while other equally deserving games continue to be largely overlooked. At times reasons can be discerned but, likewise, on occasion it can seem to be rather random and not strictly fair. 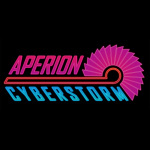 Well, Aperion Cyberstorm hasn't had a huge amount of buzz around it despite the fact it is - at this moment - a twin stick shooter that'll make its debut on Wii U ahead of PC. We certainly urge anyone who reads these words and is a fan of shoot 'em up arcade action to at least put this one on their radar; we haven't seen the final product, but what we have played is full of potential. This first made an appearance at UK event Rezzed earlier in the year and we had a quick chat with developer aPriori Digital, so this time at the larger EGX event we just sat ourselves down to play the game for a decent amount of time; we ended up playing for longer than we expected. Arena: Be the first to reach the target score to win. Survivor: Battle with a fixed number of lives. Deadline: Time-based mode. Get as many kills within the time limit to win. Last Stand: A single life per round. The player left at the end of each round is the winner. 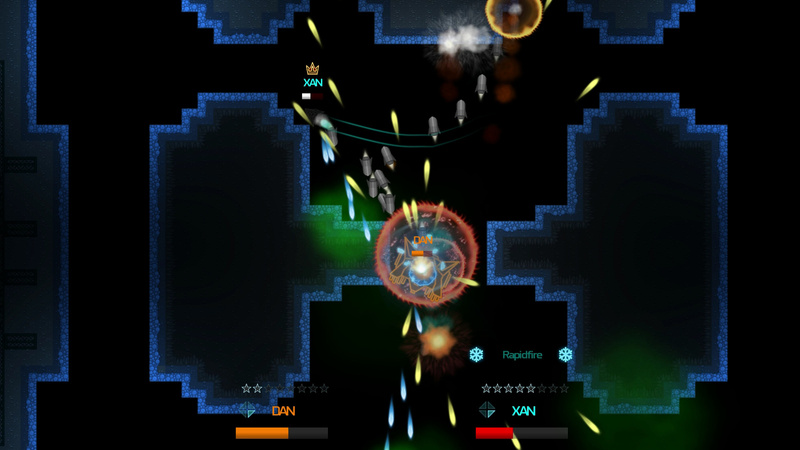 Titan: One player is randomly selected to become the Titan, a boss-like ship with extra firepower and recharging shields. Other players have to take the Titan down. The player that does then becomes the Titan. Only the Titan can score points for killing other players, but all other players can shoot each other, so you'll find that snatching a kill away from the titan becomes a common event. Battle Ball: Chase the ball and destroy it before other players do, or before it destroys you. King: Fight over a highlighted part of the map. Control: Hold the most control points to get more points. Reach the point target to win. We had a round of Survivor and it was a simple case of shoot everyone else and survive, but was handy for getting to grips with the control scheme. Though at its heart this is a top-down twin-stick shooter, there's a bit of depth in the items and customisation on offer. You choose from ships that are strongest defensively, offensively, or in their agility, while you also have a fairly handsome collection of secondary weapons to choose from. There's surprising depth to the range of ships and weapons, and they're integral when considering a strategy, based either on the mode in question or your own game style. Secondary weapons vary from destructive weapons, spread weapons or even deployable drones, and after a few minutes of making sense of the array of colours and rapid ship movement the mechanics began to click into place. 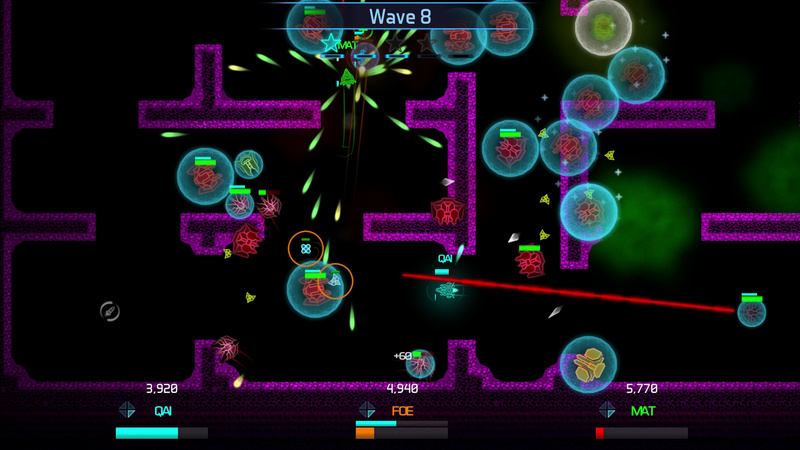 Deploying secondary weapons and executing the dash to dodge attacks became natural; yes, it's standard multiplayer arena-based chaos, but there is solid design and structure underneath the madness. Elements are key, as well, such as Ice and Fire which can be collected and change your primary attack to freeze and slow down enemies, as one example. As you become familiar with pick-ups they become strategic in themselves as you aim to grab the best options to boost your chances. After a brief Versus match we switched to an endless 'Onslaught' co-op mode in which you tackle waves of enemies with buddies. Strategy is important here, for example, as we opted for a defensively strong ship with deployable drones that distract and attack enemies. Playing with one of the developers we ended up in a session for over 40 minutes; the end condition was with both of us dying at once. When destroyed there's a re-spawn time that increases with each death, so staying alive while waiting for our companion to return provided plenty of tension as the difficulty ramped up. We were told that this mode will be tweaked to increase difficulty more quickly, but nevertheless it was an engrossing challenge. Mastering movement, item management and dodging came together naturally for us here, and we can envisage the chase for ever higher scores sucking players - and groups of friends - in. Though the development team will be tweaking the pacing to speed up the waves, we enjoyed getting into the flow of tackling different foes; the mechanics of various weapons and elements clicked nicely and we felt fully in control. Unlike some bullet hell shooters that can overwhelm to artificially end a run, our deaths here came from errors or poor tactics. What's also striking is how visually appealing this game is, which isn't particularly easy to appreciate in screenshots. The elements are simple, but the bright colour palette is striking and a big help to the player in tracking the action; this is an area the development team has been working on in recent months, apparently. 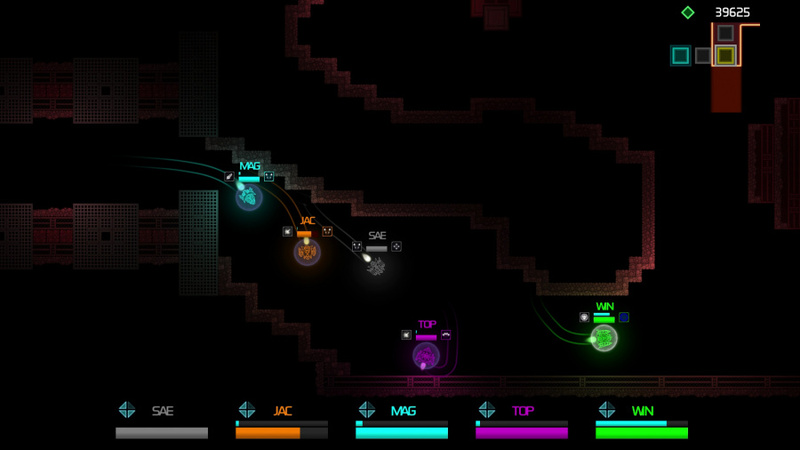 Rocking along at a rock-solid framerate, it's also as responsive as you'd expect of the genre. We didn't get to see the Campaign, but it holds promise in concept. 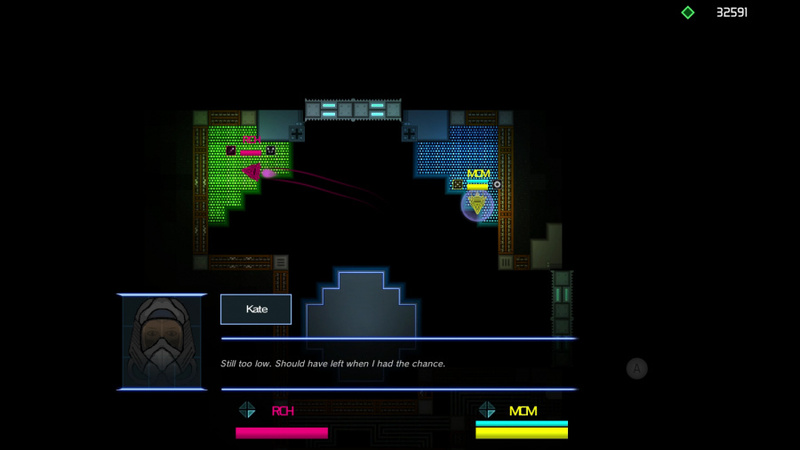 It can be tackled solo or in co-op for up to five players, and consists of four worlds and as many bosses. We're told that players "will find ships and abilities (the latter of which can be upgraded from the shards dropped by defeated enemy ships) to mix up playstyles", with the story of marooned pilot Kate being primarily told through text. Moving through different screens should offer diversity, if the sizeable number of arena options in the other modes is anything to go by. 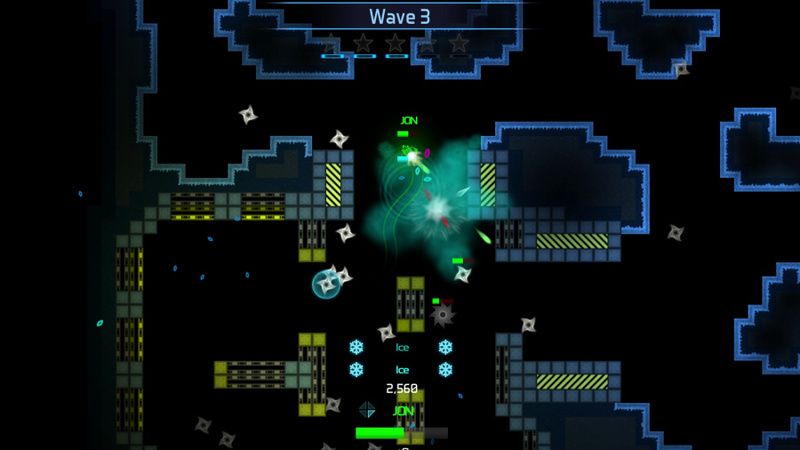 Aperion Cyberstorm is a game that can fall under the radar, but it deserves a close look as it works towards release. The Wii U hasn't been graced with a significant number of shooters like it, and it seems like an accomplished, enjoyable experience to us. We have high hopes for this one. That looks pretty sweet. The fact that it reminds me of old school arcade maze games is an extra boost. I'll likely be playing more campaign, but it could be fun to try out with my partner's kids. Gifting them Runbow tomorrow, most likely. Ooooh! This is definitely on my radar, it looks awesome! Sure are alot of twin-stick options on Wuu. I love schmups. Most are garbage but when done right, they're one of my all time favorite genres. This is looking like a day one for me, provided the price is reasonable. I didn't hear of this before now. Thanks for the heads up! Looks cool but I'd rather have robotron 2084! Looks like a blast, thanks for the info.. I like the look of this! Looking forward to seeing a trailer of the Onslaught co-op mode! As with any shooting game on Wii U, if it doesn't have Wiimote + Nunchuk support with pointer aiming then I'm not interested.